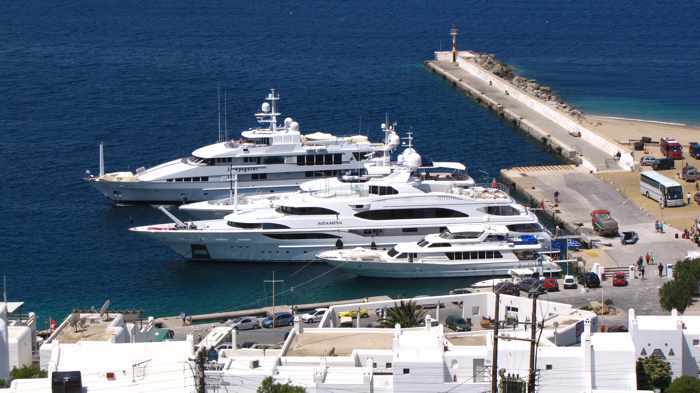 A view of several charter yachts berthed at the Old Port in Mykonos Town. 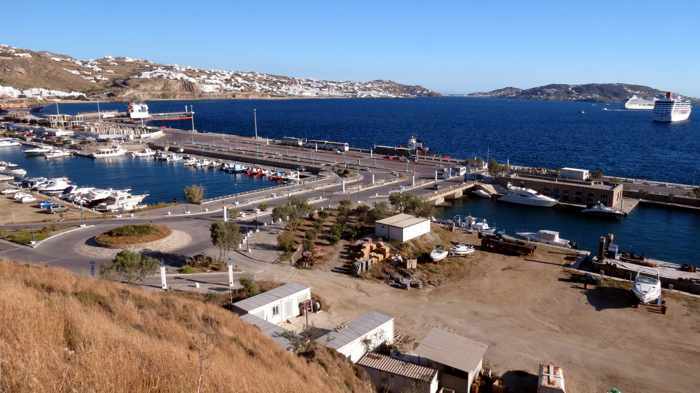 For years, small passenger-only ferries have docked at the pier behind the yachts, but as of April 2019 all ferries must now use the New Port in the island’s Tourlos district. 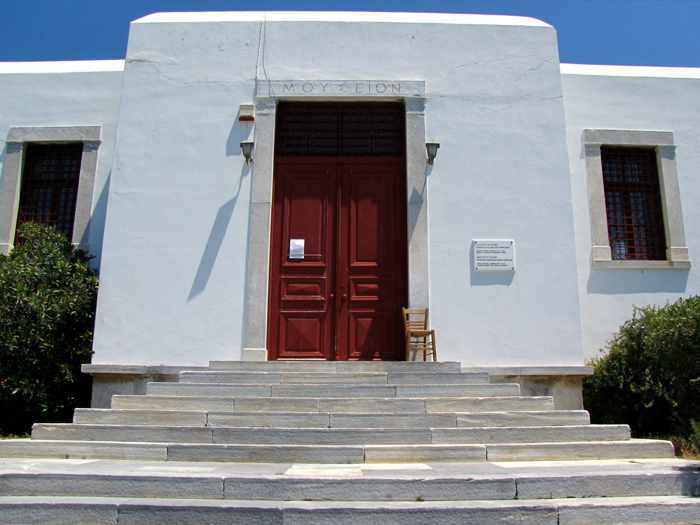 Situated only 10 minutes’ walking distance from the bustling commercial centre of Mykonos Town, the Old Port was a highly convenient arrival and departure point for many travellers arriving at or departing from Mykonos by passenger ferry. 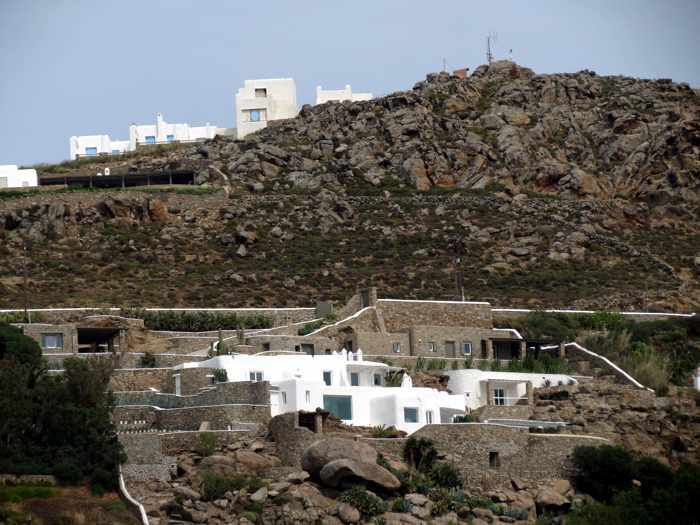 If they weren’t lugging heavy baggage, they could easily walk to hotels in the town core, or to bus depots where they could catch cheap rides to accommodations at popular beaches like Paradise, Platis Gialos and Ornos. 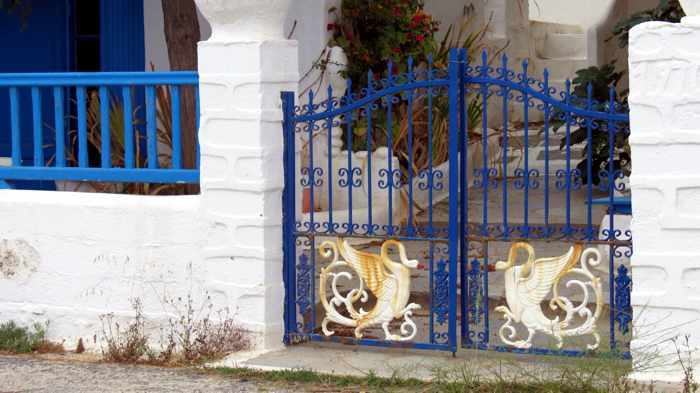 This saved them the cost of taxi fare — that is, if they could even find a cab. 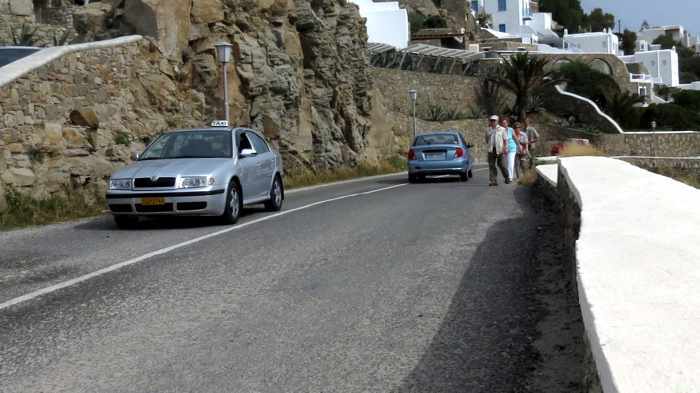 There are only 31 regular taxis on the island, and they can be hard to come by during July and August when the island is packed with overnight holidaymakers and thousands of cruiseship day visitors. 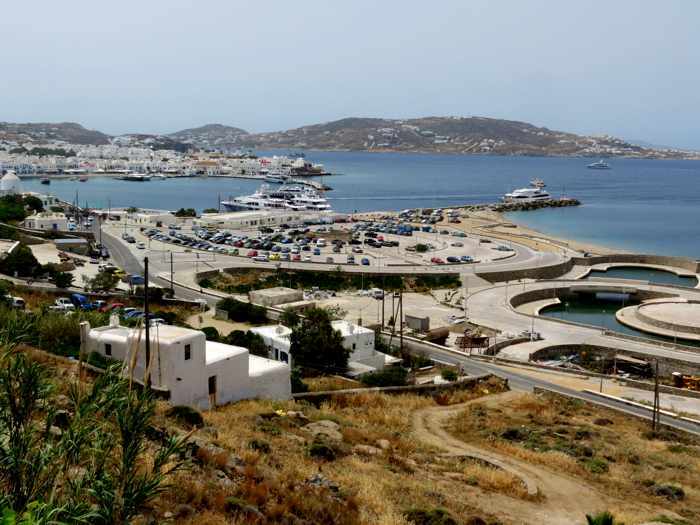 People have reported long waits at the port — up to two hours in August — before they were able to get a taxi ride to their hotels. 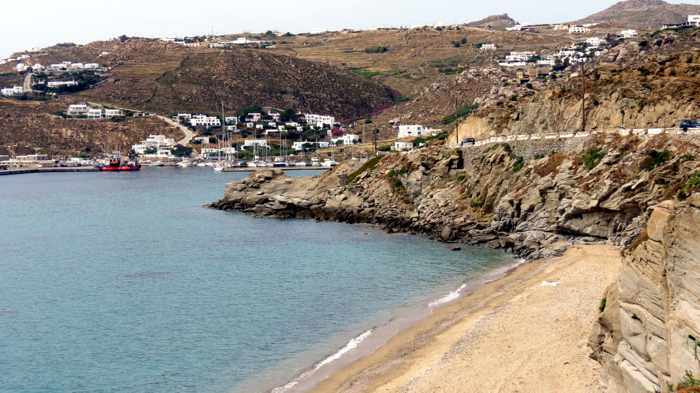 The New Port, by comparison, is nearly 2 kilometers from the Old Port — if you measure the distance along the busy and narrow coastal road that links Tourlos to Mykonos Town. 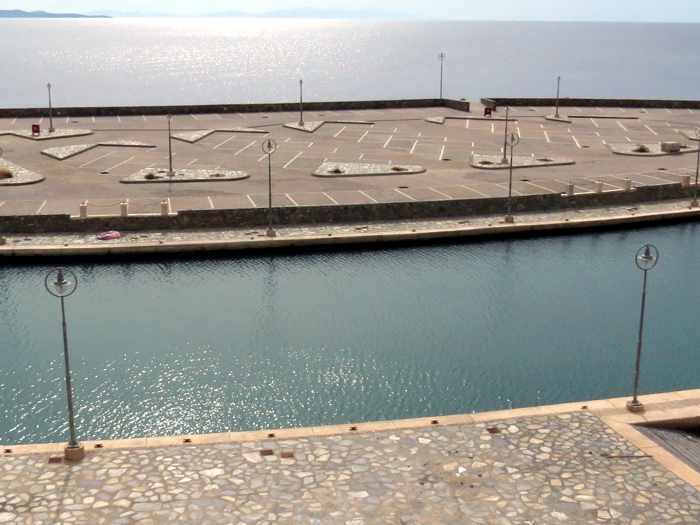 For travellers staying in or close to Tourlos , or at nearby Agios Stefanos beach, the New Port is a convenient arrival and departure location. 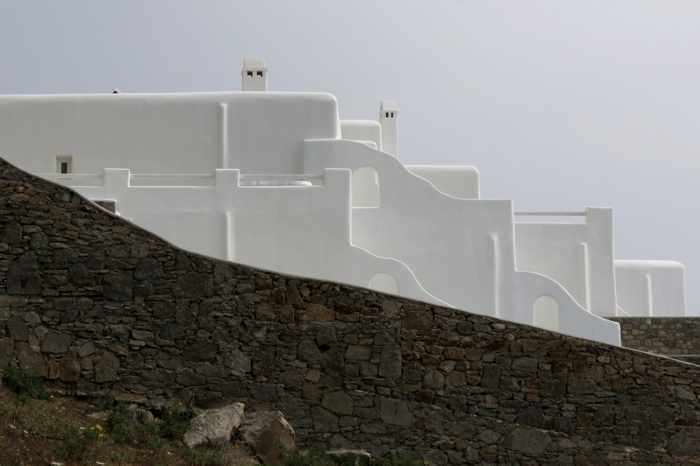 But since most visitors stay elsewhere on the island, how can they get to their accommodations from the New Port? 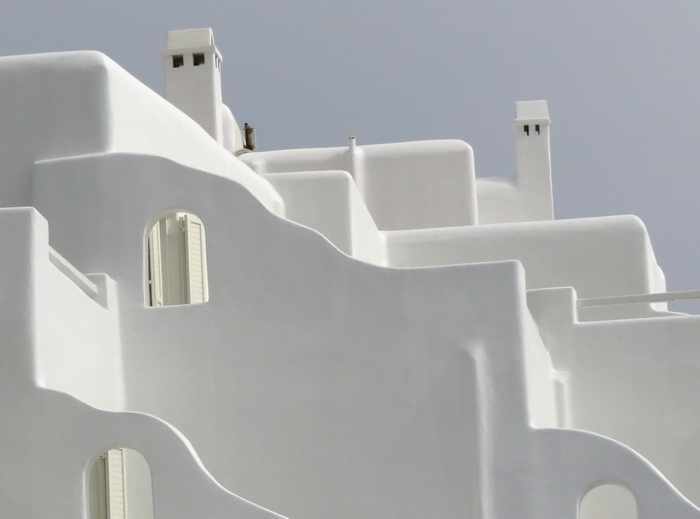 ♦ When booking accommodations, ask your hotel, B&B or private rental management if they provide a transfer service from the port. 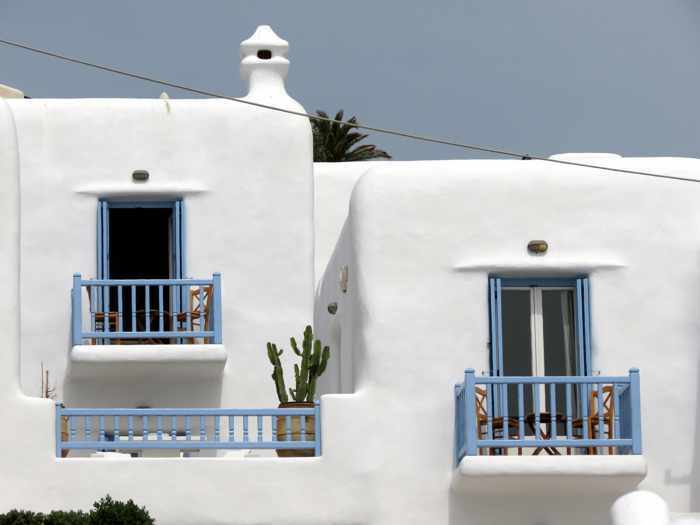 Many Mykonos hotels offer free pick-ups in their own shuttle vans, while others offer this service for a fee or can arrange a transfer (also for a fee, of course). 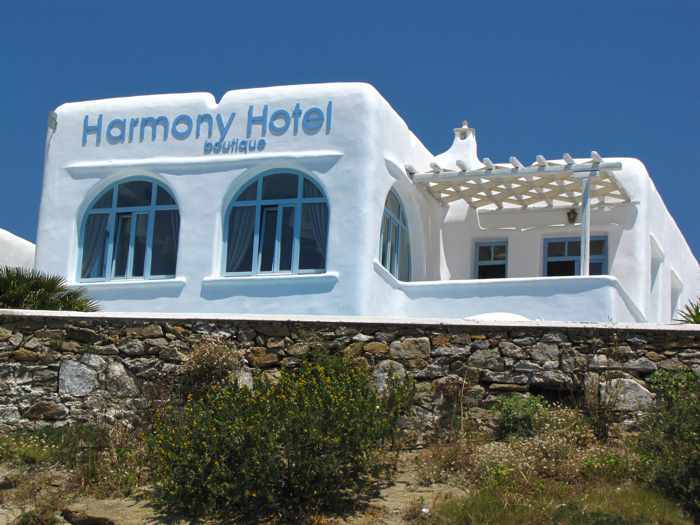 We have always stayed at hotels that offer transfers, and have found it makes getting from the ferry to our room a hassle-free breeze. 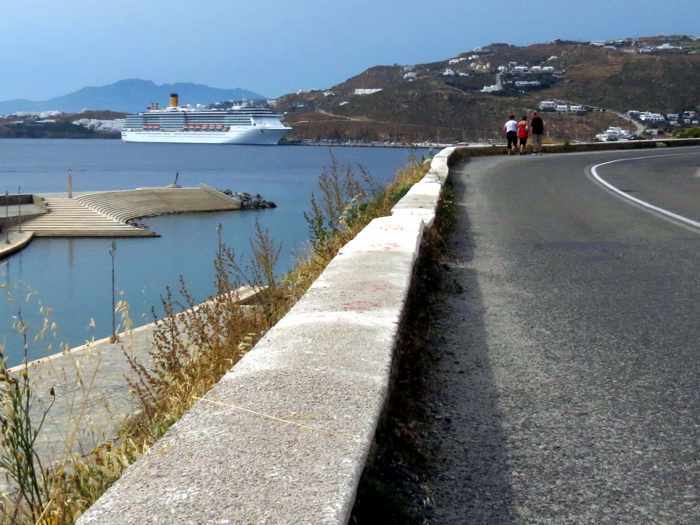 ♦ Taking a taxi –if one is available at the port — is an alternative. 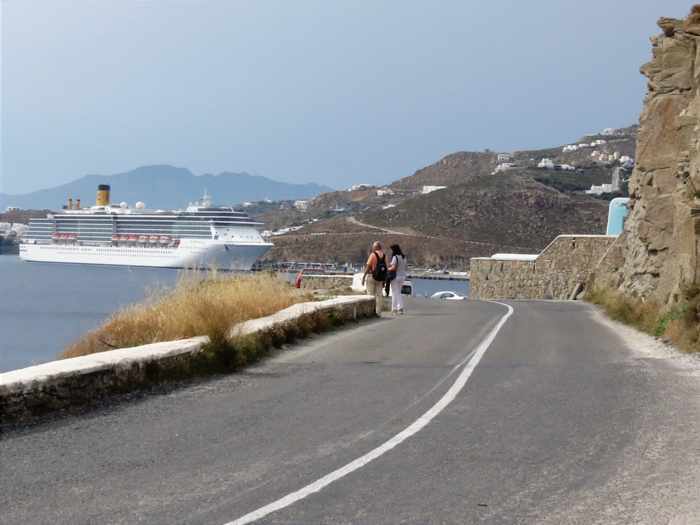 As mentioned earlier, though, travellers can experience long waits for taxis in peak season, especially on days there are multiple cruise ships in port, because of heavy demand for the small number of cabs on the island. 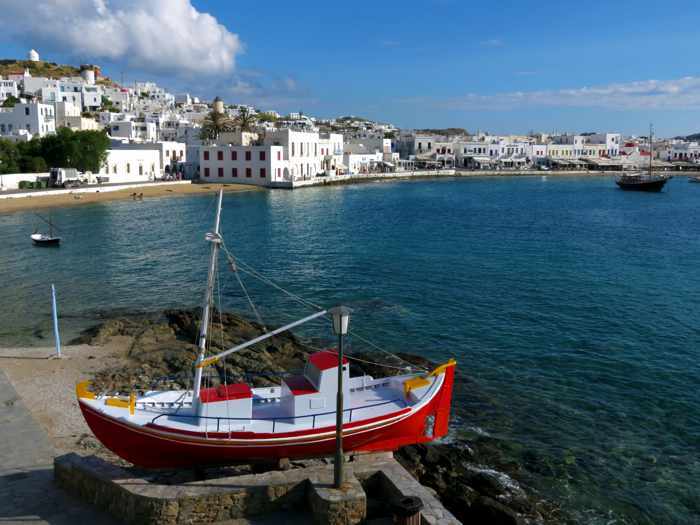 ♦ Uber is illegal in Greece, but another service — Aegean Taxi — offers a downloadable app travellers can use to order a transfer. 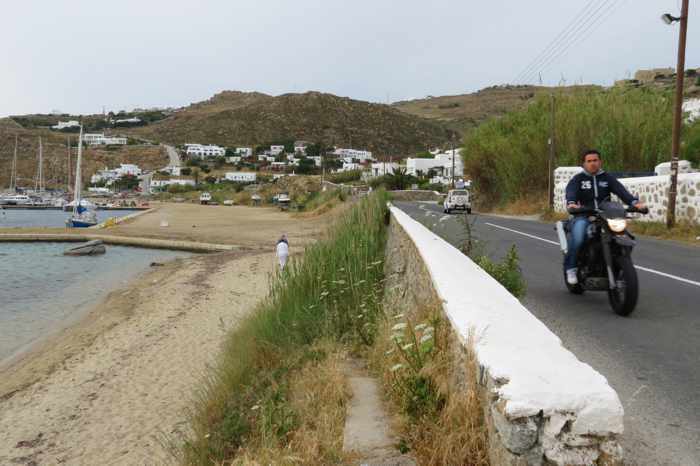 Aegean Taxi has English-speaking drivers available with three categories of vehicle, ranging from budget-friendly car rides to luxury SUVs and vans. 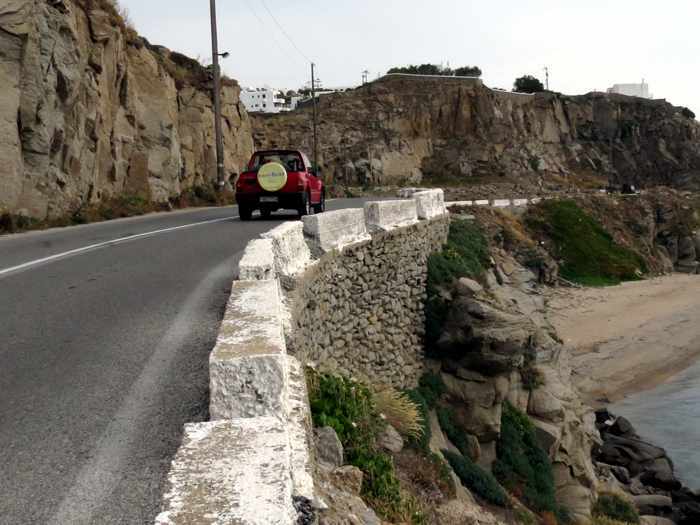 Prices for rides in 4-passenger cars start at €9, while transfers in 4-passenger SUVs start from €30. 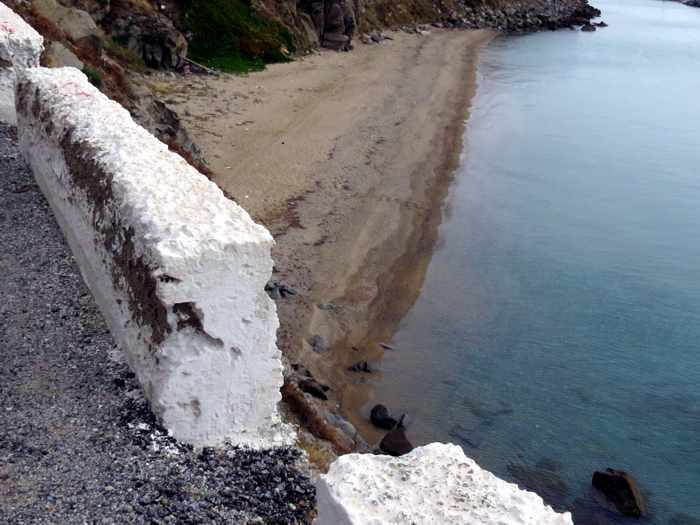 Rates for vans accommodating up to 8 people start at €40. ♦ Book a private transfer. An online search will turn up scores of companies that provide transfers and private drivers, but this service tends to be considerably more expensive than taxi fare and sometimes outrageously so. 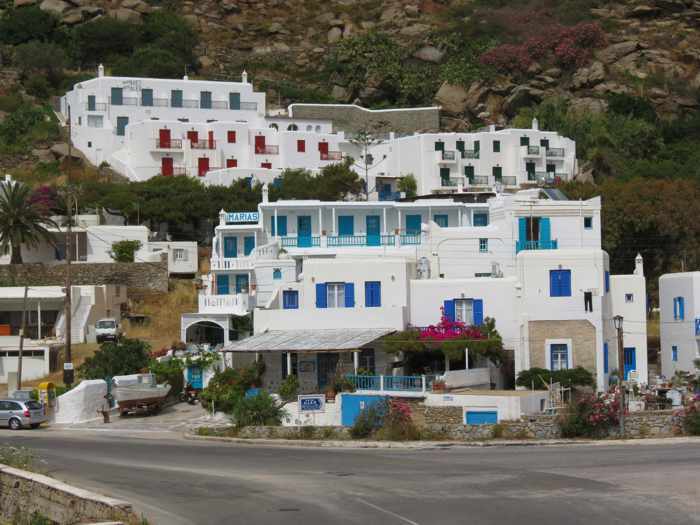 ♦ Take a bus to Mykonos Town. Cheap local bus transportation is available, but the bus schedules depend upon the time of year you’re visiting. 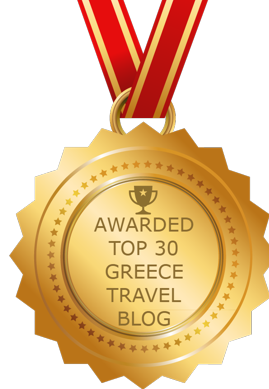 Service is most frequent during the peak season months of July and August. 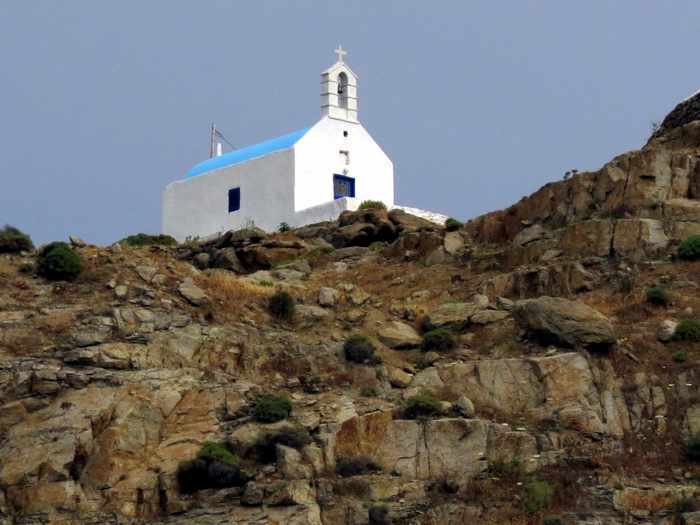 Check the KTEL Mykonos Bus Service website for schedules a few days before you head to the island, since the timetables are updated frequently throughout the tourist season. 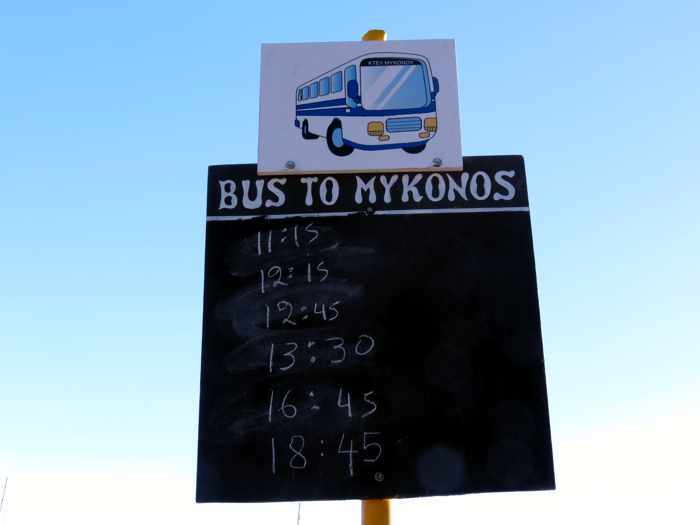 The bus ride to Town takes just over 5 minutes and costs less than €2 per person. 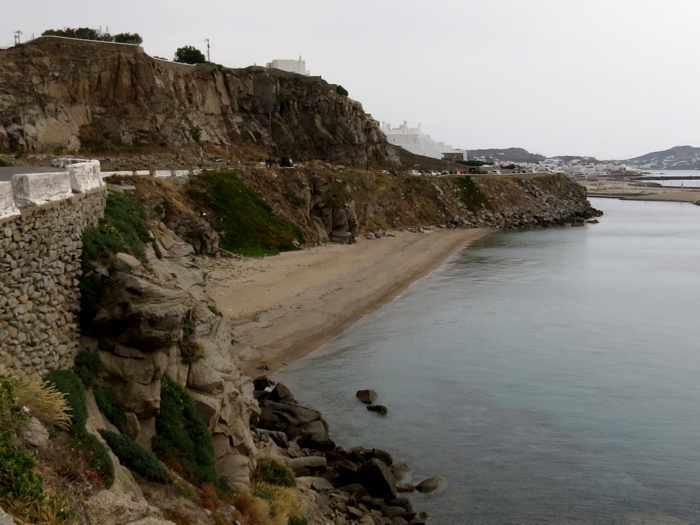 If you aren’t staying in Town, but at a beach area, you will have to catch a different bus to continue onward — and payment of another fare will be required for that ride. 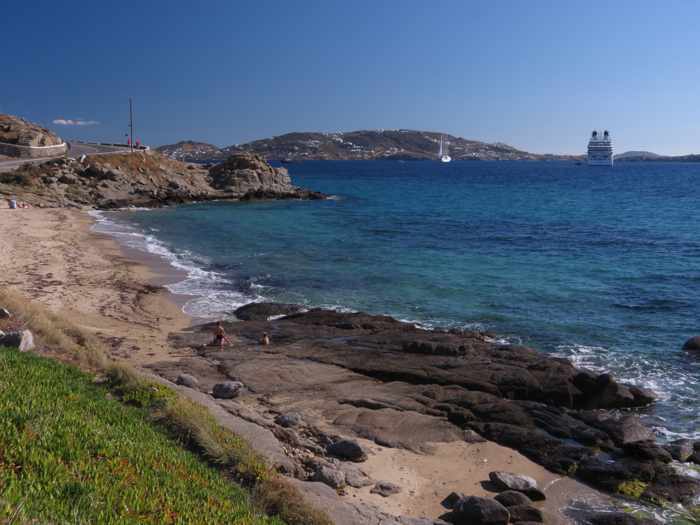 Check the KTEL site for information about departure stations and timetables for service to up to 10 popular beaches. 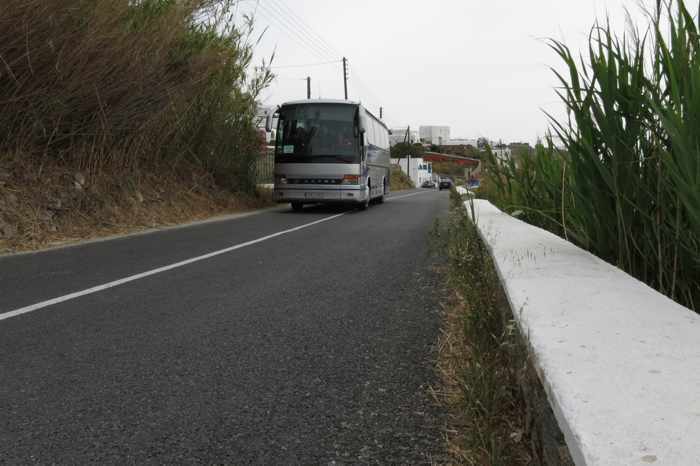 The bus company also provides private minibus transfers and tours, and can arrange for private bus transfers for large groups. 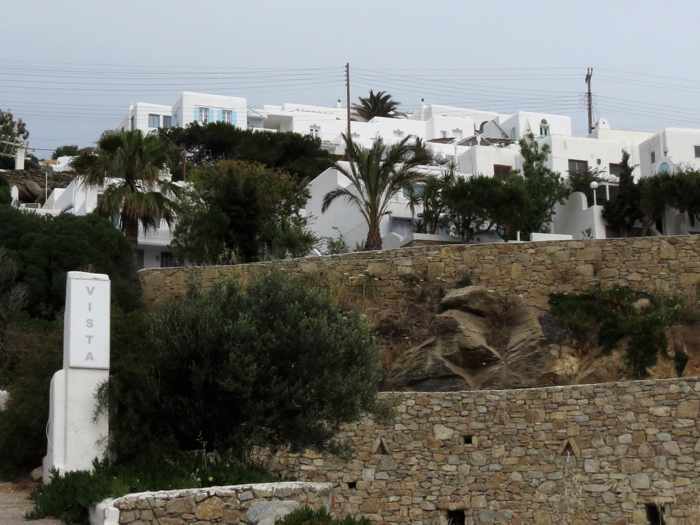 KTEL Mykonos buses at the Fabrica Square station in Mykonos Town. 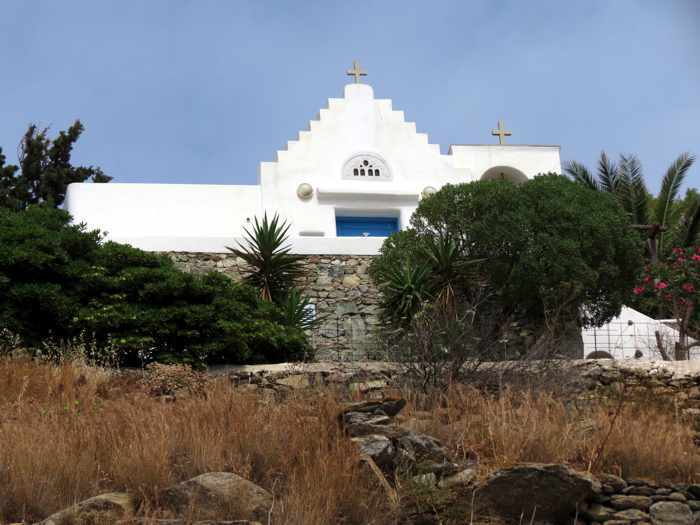 KTEL offers scheduled bus routes to numerous island destinations, but also provides private tours and transfer services, particularly for large groups. ♦ Take the SeaBus water shuttle to Town. 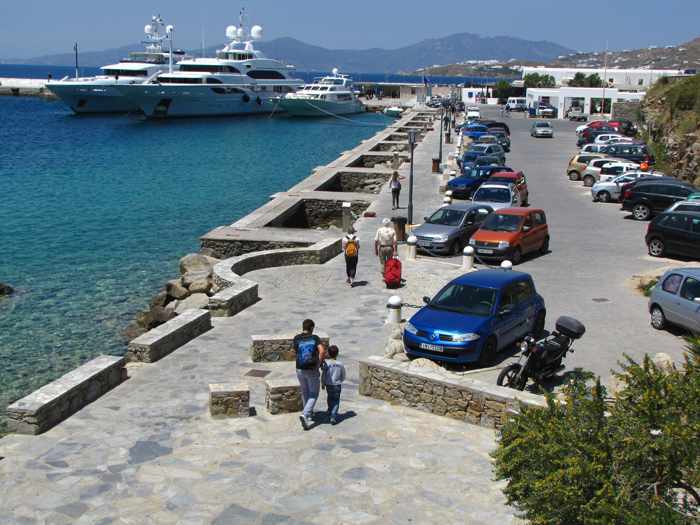 The Mykonos SeaBus offers two pick-up points at the New Port, and two drop-off locations in Town, with the final stop near the Mykonos Town Hall being the most popular place for passengers to disembark. 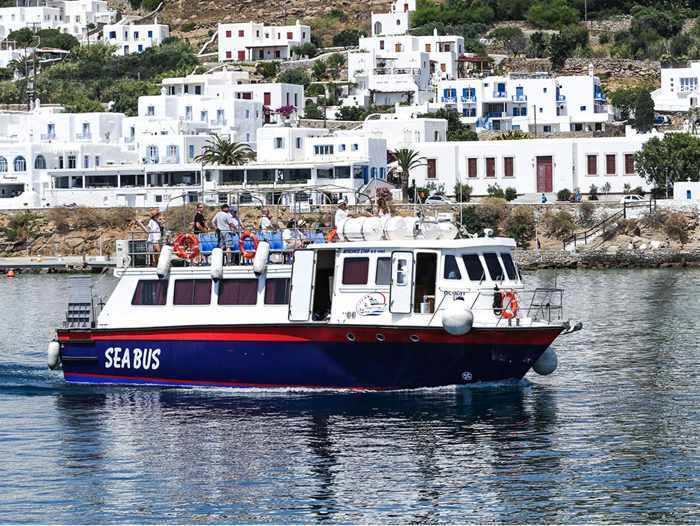 The SeaBus runs every half hour, and the scenic trip along the Mykonos seaside takes less than 10 minutes. Check the SeaBus website for schedules and additional information. The SeaBus is wheelchair accessible, by the way, and passengers can take luggage and baby strollers aboard. 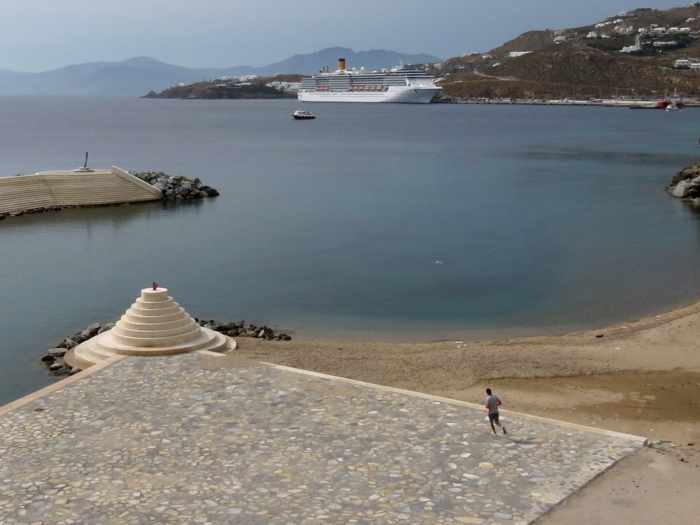 A one-way ride on the Mykonos SeaBus, seen in this image from the SeaBus website, costs just €2 per person. 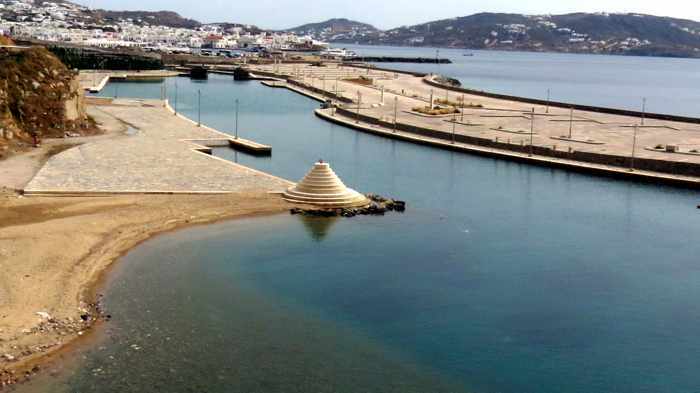 The ride from the New Port to Mykonos Town takes under 10 minutes. 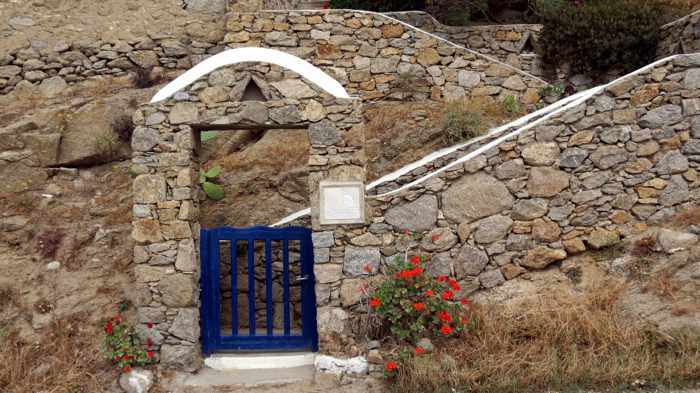 ♦ Walk to Town. 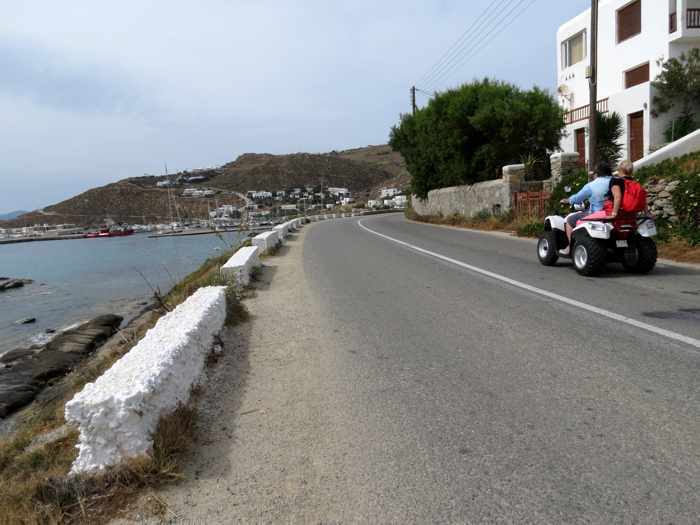 This is perfectly do-able, since the distance along the coastal road is just 2 kilometers. 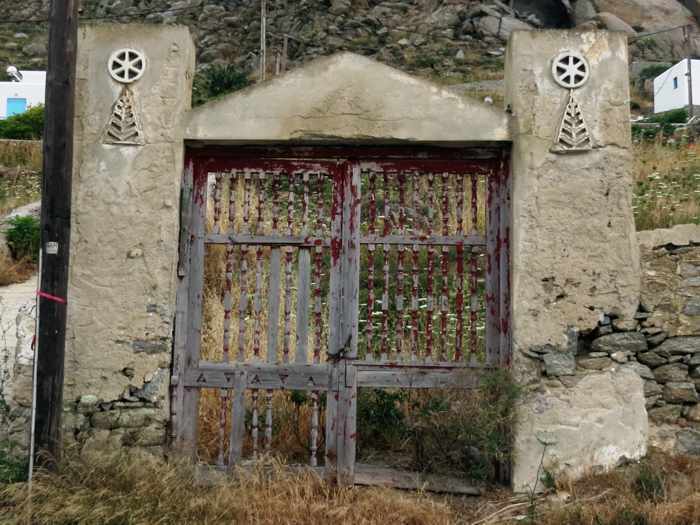 I have walked the route at least half a dozen times, though always in low season. 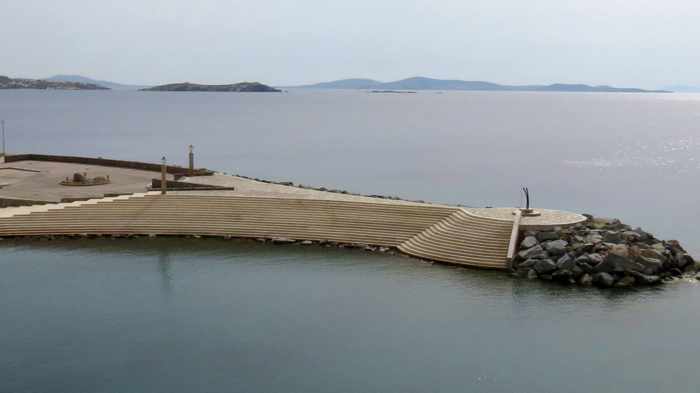 But it’s not something I would recommend for people visiting Mykonos during peak summer, when the island is clogged with traffic. 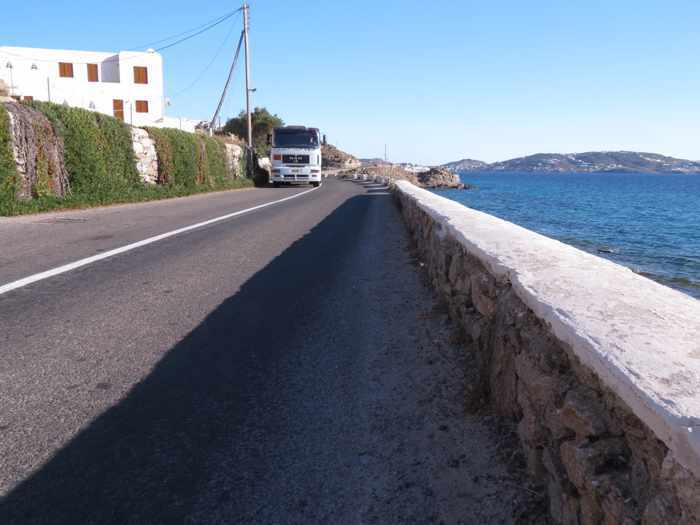 The coastal route can be nerve-wracking and perilous to walk, since the two-lane road is narrow and tends to be very busy with fast-moving vehicles that include buses and large construction trucks. 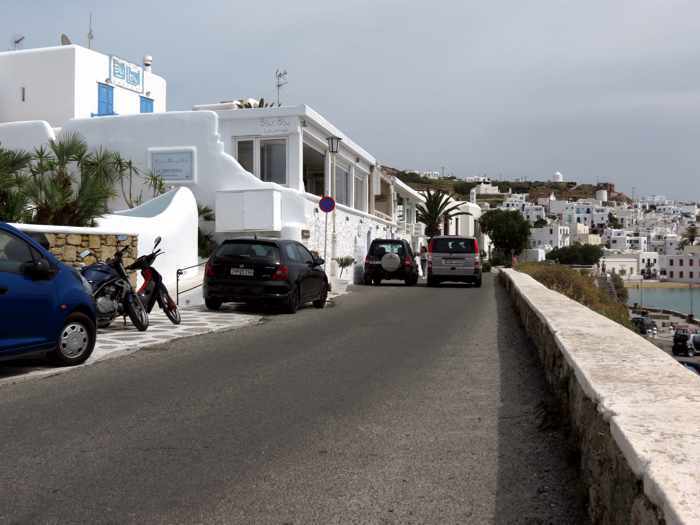 There are no sidewalks, and in many places no shoulders that allow pedestrians a safe space to walk along the side of the asphalt road. 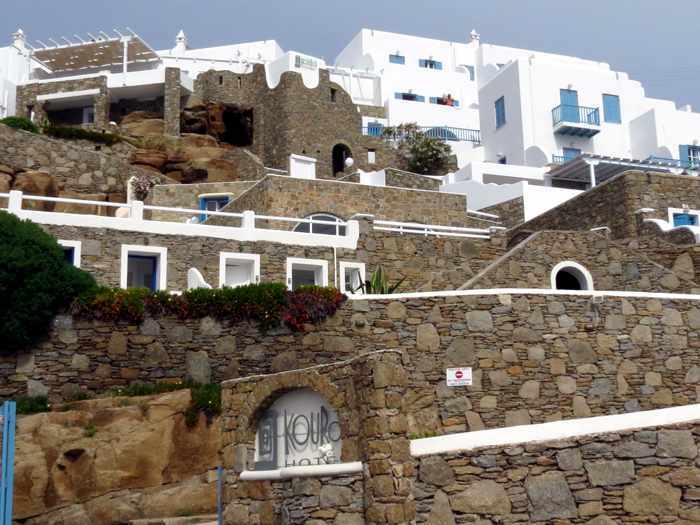 I still have vivid memories of the times we arrived at the New Port and transferred to our accommodations in hotel shuttle vans. 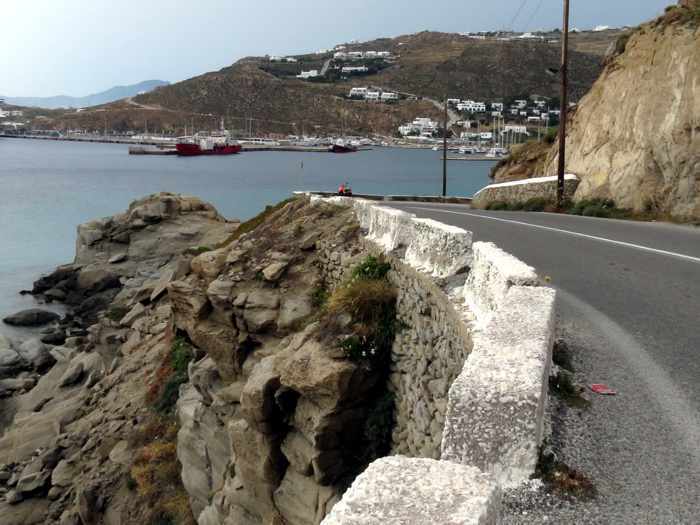 Though the highway was busy with traffic moving briskly in both directions, the driver had a heavy foot on the pedal and passed alarmingly close to people walking to Town from the port. 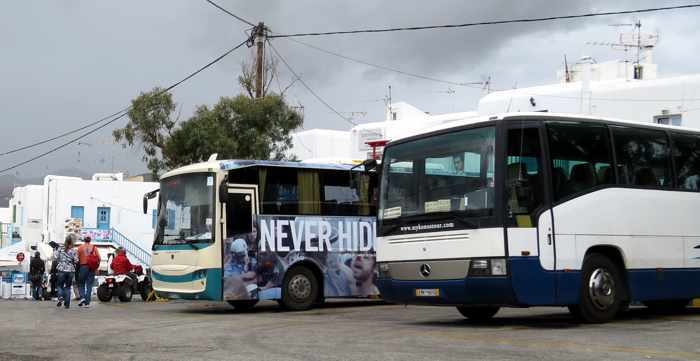 It was after dark, and it was downright frightening to see walkers appear in the headlights as our shuttle bus approached from their rear and swerved only slightly to pass them. 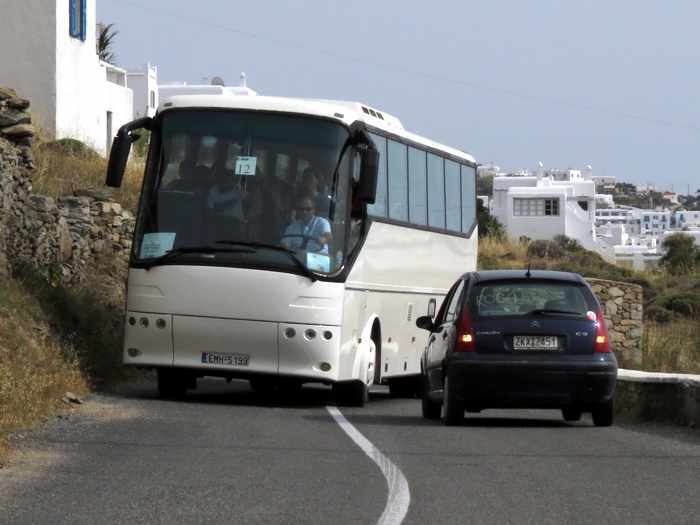 Frankly, I was shocked that the driver didn’t slow down or try to give the pedestrians more room — but, as I soon discovered, that’s how the locals drive, whether at night or in daytime. If you do decide to hoof it into Town, pay close attention to the traffic, make certain you walk as far off the asphalt as possible, and give oncoming vehicles as much space to pass as you can. 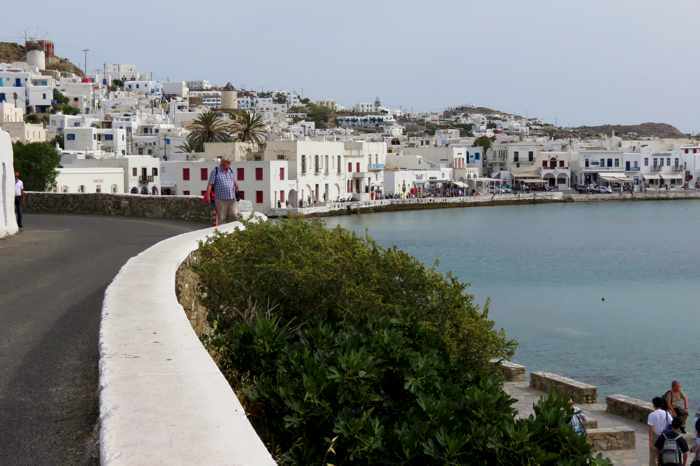 Take the same precautions whenever you’re walking on Mykonos Town streets and roads where vehicles are permitted to drive — especially after dark. 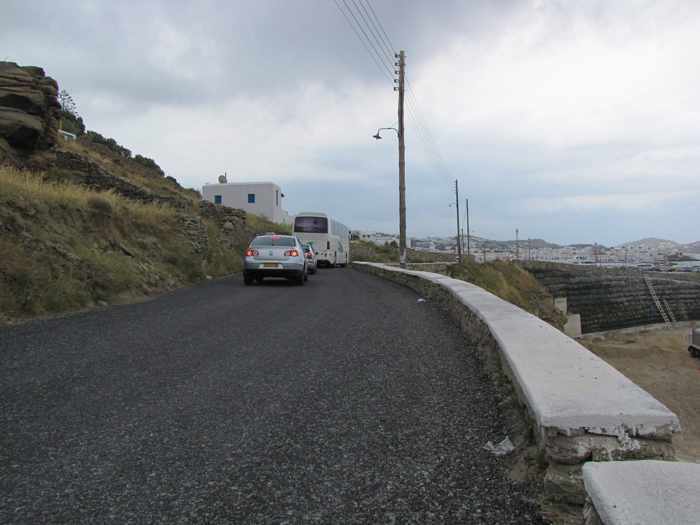 On narrow lanes, we’ve had our arms whacked by side view mirrors and have nearly been sideswiped by vehicles that didn’t slow down or make any effort to share the road. 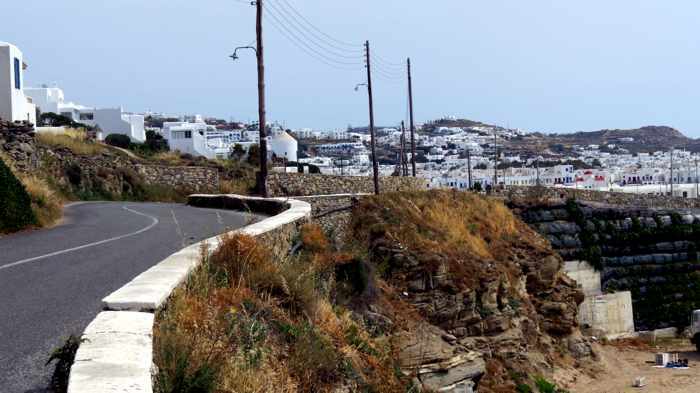 Most of the commercial center of Mykonos Town is a pedestrian zone, so most lanes and alleys are safe to walk there — though you might occasionally have to make way for small service vehicles that are allowed through to make deliveries and collect trash. 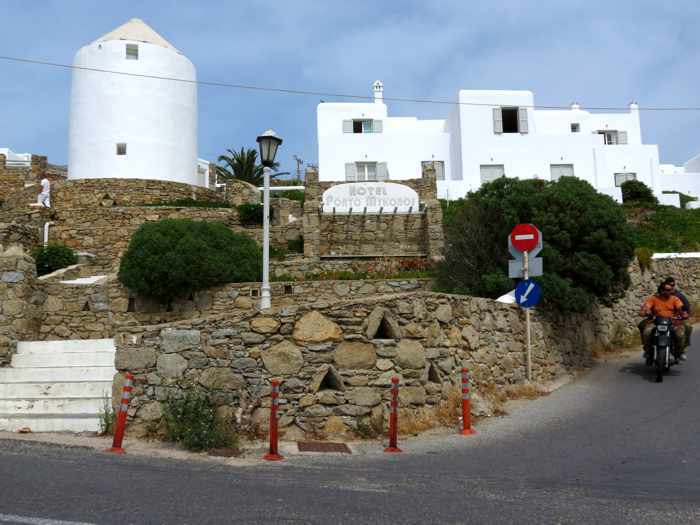 Below are photos we have shot during some of our walks from the New Port area into Town, showing the road and walking conditions, as well as hotels, restaurants and various sights along the way. 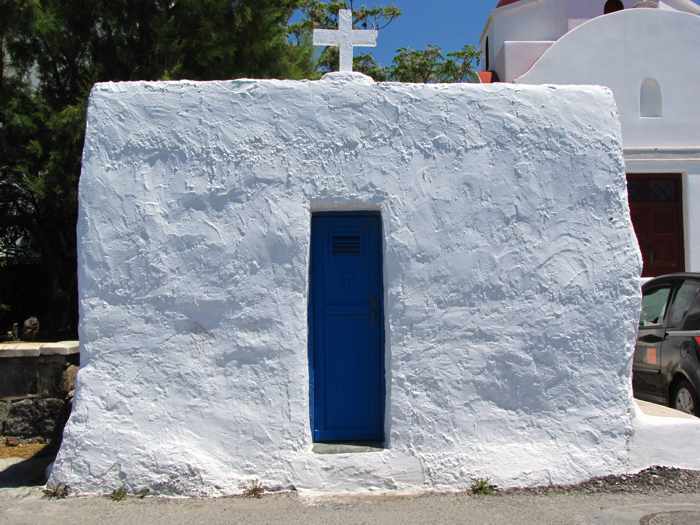 You should be able to decide from the pictures if you would feel comfortable making the trek yourself. As you exit the New Port facility you will see Matthew Taverna directly across the street. 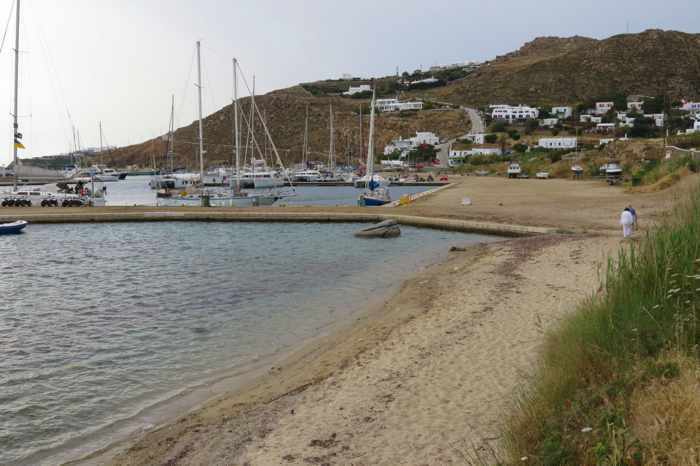 It’s a great spot to have a drink or meal either right after arriving at the New Port, or while waiting for a ferry departure — the food and service are excellent and the prices are reasonable (for Mykonos). 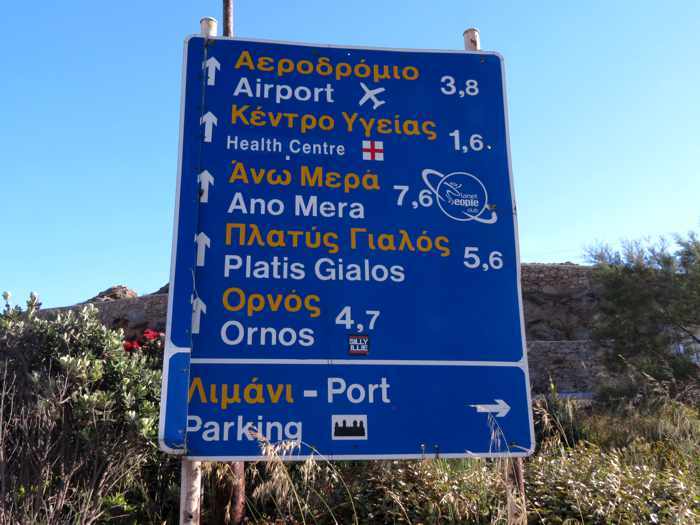 A bus stop sign on the main road near the New Port entrance/exit. 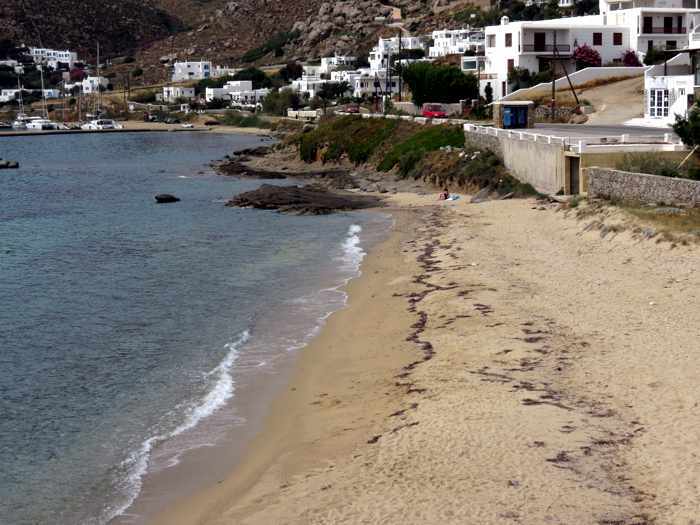 I shot this photo during a May visit to Mykonos when bus service to the New Port, Tourlos and Agios Stefanos beach was operating on a limited daily schedule. 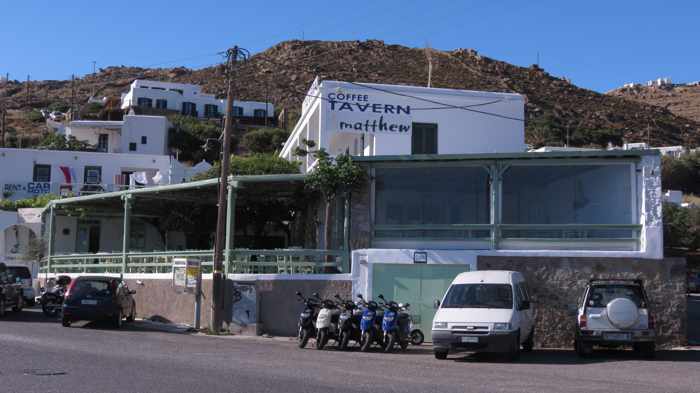 The driveway entrance to Makis Place hotel is situated to the right of Matthew Taverna. 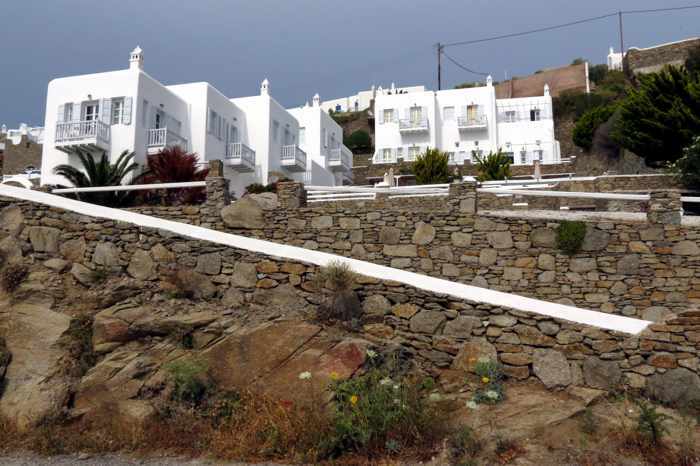 Makis Place is tremendously popular with Mykonos visitors who want accommodations close to the New Port, and it’s definitely the closest. 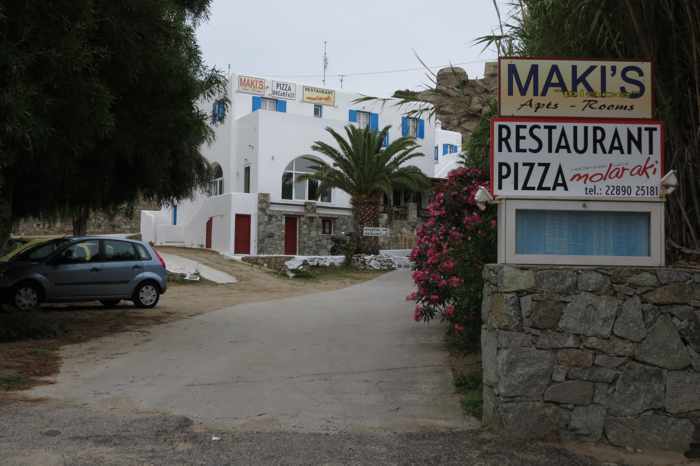 The hotel’s Molaraki restaurant serves excellent food at reasonable prices. 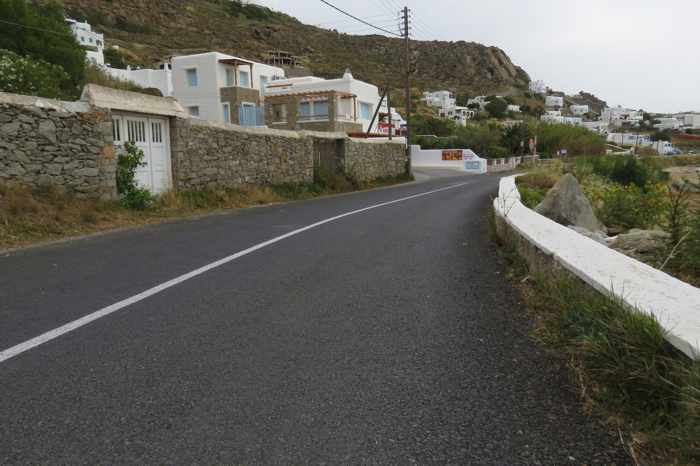 Approaching the Arista supermarket on the left. If you’re staying in a studio in Tourlos, or want to pick up a snack or beverage while walking to Town, this is the only shop in the area. 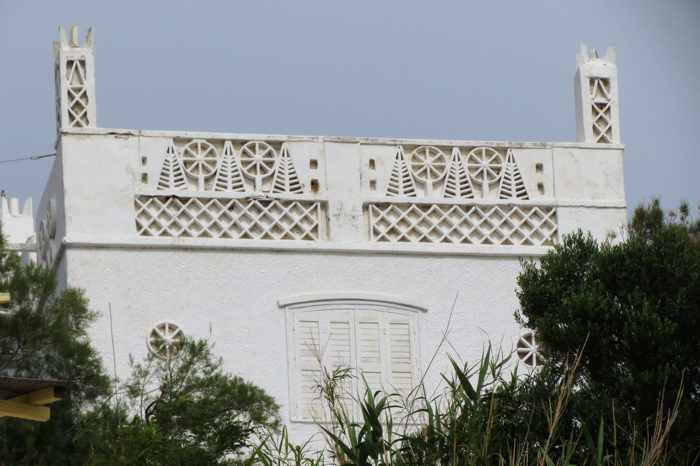 Road view of the Olia Hotel. 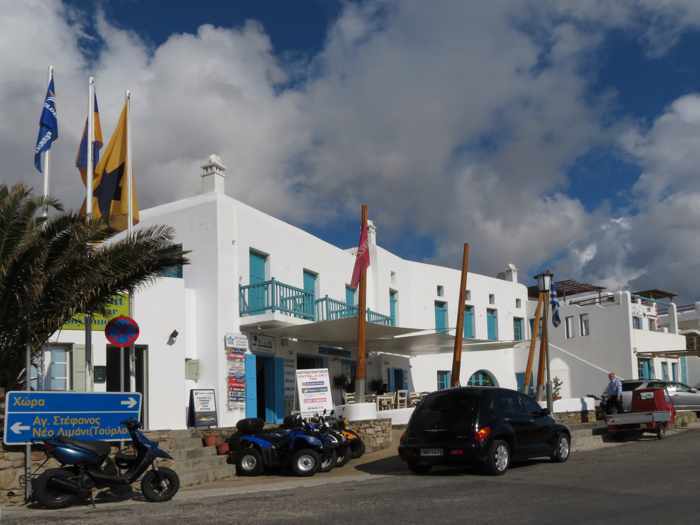 Its restaurant, Meze on Port, overlooks the marina and port facility and is a good spot for drinks and food. 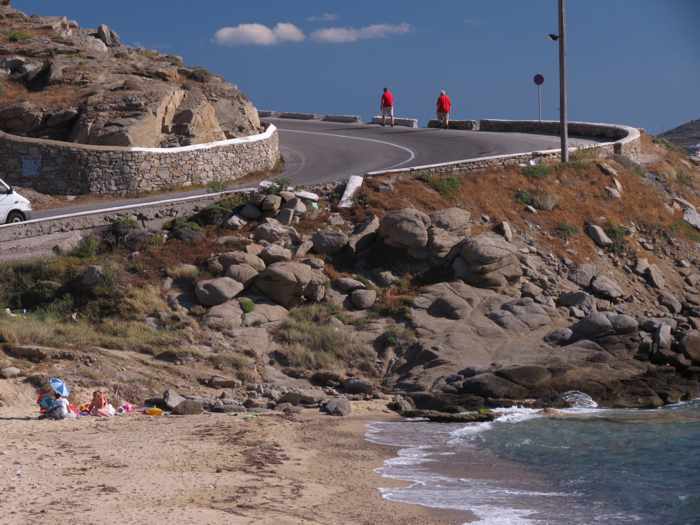 Approaching Tourlos beach. One of the top-rated restaurants on the island, Compass, is located in the building that the fuel truck is passing. 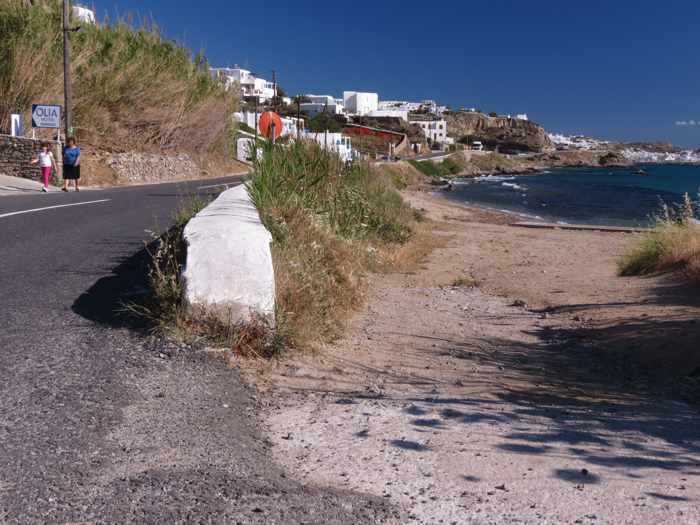 A fork in the road near Tourlos beach. 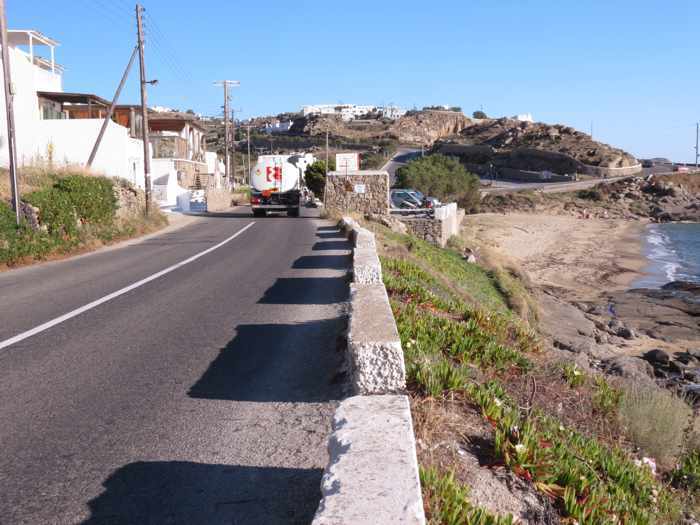 Keep to the right to stay on the coastal route to Mykonos Town. 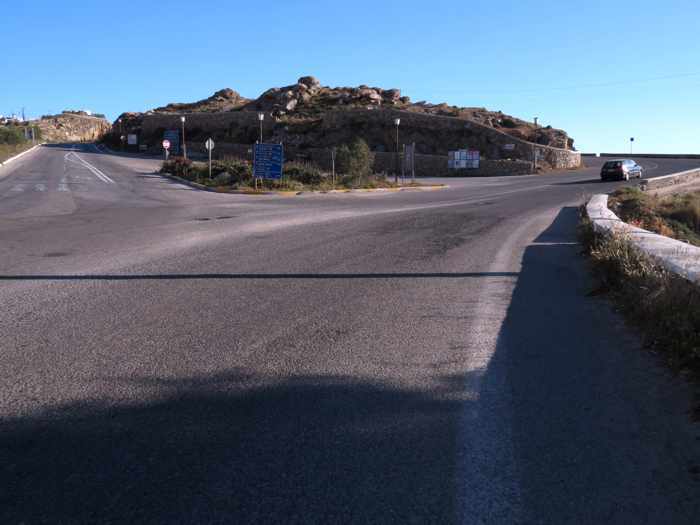 The road on the left side of the hill is a peripheral highway that bypasses the town. 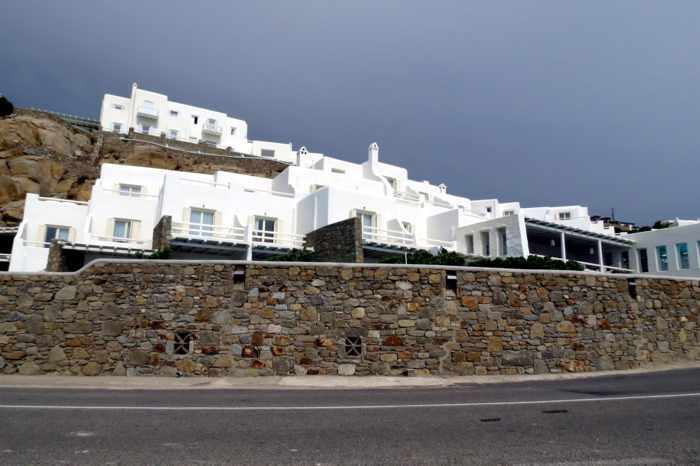 Road view of part of the Cavo Tagoo complex of hotel rooms & suites and exclusive villas. 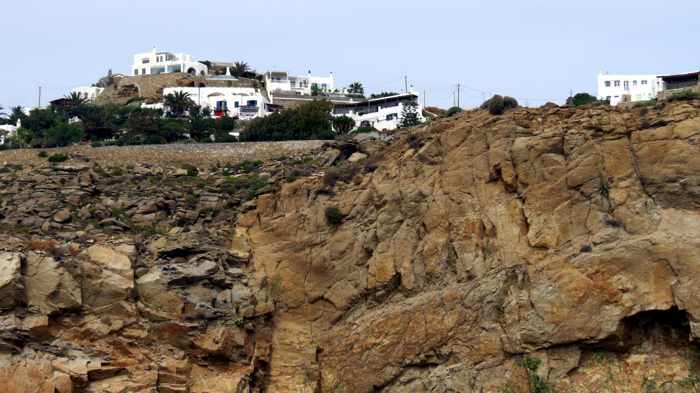 Many of the posh suites boast private swimming pools, while some have indoor cave pools. 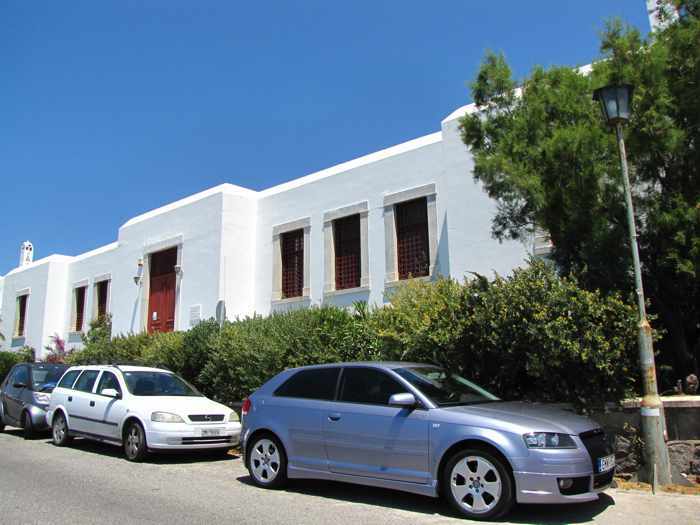 Approaching Blu Blu Lounge and Roca Cookery restaurant as the road passes above the Old Port area. Blu Blu is a popular spot for meals and drinks, as well as for watching major sports events on big screen TVs in its sports room. It also has an Internet lounge. 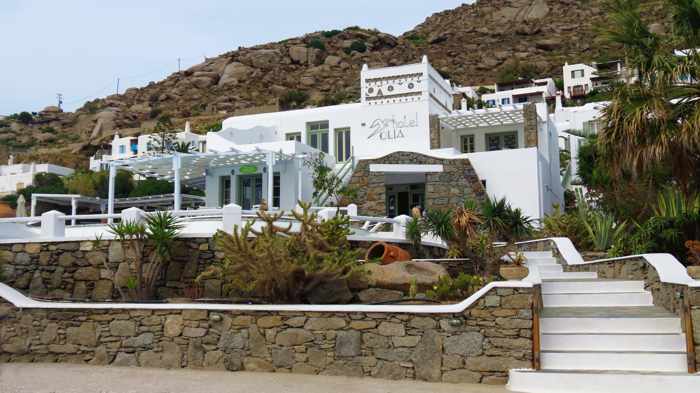 Roca Cookery serves delicious Greek cuisine and seafood, and has marvellous views of Mykonos Town, the harbour and the sunset.